A freshly updated edition of the best introduction to one of the world’s most popular products, The Coffee Book is jammed full of facts, figures, cartoons, and commentary covering coffee from its first use in Ethiopia in the sixth century to the rise of Starbucks and the emergence of Fair Trade coffee in the twenty-first. 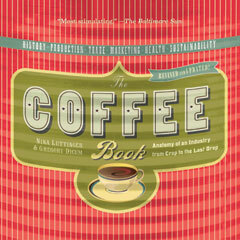 The book explores the process of cultivation, harvesting, and roasting from bean to cup; surveys the social history of café society from the first coffeehouses in Constantinople to beatnik havens in Berkeley and Greenwich Village; and tells the dramatic tale of high-stakes international trade and speculation for a product that can make or break entire national economies. It also examines the industry’s major players, revealing how they have systematically reduced the quality of the bean and turned a much-loved product into a commodity and lifestyle accoutrement, ruining the lives of millions of farmers around the world in the process. Finally, The Coffee Book, hailed as a Best Business Book by Library Journal when it was first published, considers the exploitation of labor and damage to the environment that mass cultivation causes, and explores the growing “conscious coffee” market and Fair Trade movement. A Library Journal "Best Business Book"